Much of Catholic custom, lore and traditions have been forgotten at best, or deliberately suppressed at worst in recent times because they seem to put us in a somewhat embarrassing light - incriminatingly making us the target of jokes and accusations of being out of touch with modern times, burying our heads in regressive reading of history. Certainly today’s feast, to the sensibilities of modern man - both Catholic and non, seems to be another oddity, if not occupying a place at the top of the list of strangest things about the Catholic Church. Today we celebrate a feast named after a chair. Now, the obvious question would be this – why would the Catholic Church ever bother to dedicate a feast, a first class feast for that matter, to an inanimate household furniture? Isn’t this idolatry gone all wrong, the stuff of some sick parody? It’s like putting your favourite sofa on the family altar, Right? Well, the chair in this case refers to the Chair of St Peter, or in Latin, Cathedra Petri. The Latin name therefore suggests the wider significance of this object. It’s not just any chair. It’s not even its historical association with St Peter, the First of the Apostles and our First Pope. The name of the Chair in Latin provides the name of the principal church where the bishop sits. The Bishop’s chair, his cathedra, thus defines the church building, the Cathedral, and in fact, the Church itself. Just to further whet your appetite on Catholic trivia, the Latin word for ‘seat,’ the synonym we have for chair, gives rise to the title and name of the very government and state of Vatican, the Holy See. It is clear from these examples, that the Church is preoccupied with something more than a household furniture. We are speaking here not of the physical object, but the very authority that springs from it. It is the very symbolic significance of the Chair that must be the focus of our meditation today. In today’s gospel, we have the beautiful and powerful story of Peter’s confession. Peter’s confession that Jesus is the Son of God and the promised Messiah, is matched, or in fact, outdone by Jesus’ own confession, his pronouncement that Peter is the “rock” upon which the entire spiritual edifice of the Church is built. This new name of ‘rock’ again is not a reference to any geological boulder, neither is it even a reference to Peter’s personal character. The meaning of ‘rock’ can only be understood on the basis of a deeper mystery: through the office that Jesus confers upon him, Simon Peter will become something else that, in terms of “flesh and blood”, he is not. It comes not from man but from God – the authority of St Peter. Thus the authority conferred upon Peter and his successors is a gift from Jesus Christ to us. The Jews believed that their Temple is built on a rock - the very spot where creation of man began; it is the rock upon which Abraham sacrificed his son Isaac; again it is the rock which formed the foundation stone for the Temple, God’s footstool on earth; and finally it will be the convergent point of a pilgrimage of nations that will mark the Messianic Age. The Syriac speaking Christians were so bold to assert that Jesus conferred upon Simon Peter, his very own title, the Rock of Salvation. Jesus gave his own name to Peter. Now, Simon Peter, the first to profess the faith in Jesus Christ and the first witness of the resurrection becomes the rock that is to prevail against the destructive forces of evil. But a rock can also serve as a chair or a seat. Therefore the symbolism of the rock has now been transferred to the Chair. Just as Peter is the Rock, so is he the Chair too, and all his successors who occupy that same office. His authority thus lies somewhere between the Rock and the Chair. It becomes the very symbol of Christ’s promise of indestructibility, it is the very symbol assuring us that though the Church may be rocked by scandal, hit by storms of persecution, infiltrated even by the forces of evil in the form of sin and heresy, the rock remains intact, the Chair remains indestructible, Christ’s promise of care and protection for the Church remains unbroken. 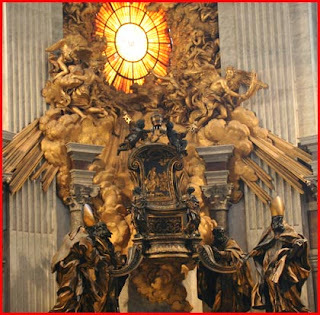 If you visit St Peter’s Basilica in Rome today, you would most likely see the Chair of St Peter, the Cathedra Petri, elegantly and beautifully encased in bronze and gold ornamentation artistically designed by the great Renaissance architect and artist, Bernini. It is set against the apsidal wall behind the high altar of the basilica, surrounded by angels, lifted up on the shoulders of the four great doctors of the Church, placed just beneath the only stain glass window in this church, the Holy Spirit Window, as if it was hovering in mid air. But it is not just its aesthetical beauty which we are invited to admire. We are asked as children of the Church, and sons and daughters of God, to contemplate once again the vision of the very essence of the Church and the place within the Church of the Petrine Office, the office and authority of the Pope. Many in the world today as in the past would like to see a man, a Pope who presides in charity, in love. But the Feast of the Chair reminds us once again, that that love must always rests upon faith, faith based upon the Truth. When speaking objectively of Truth, we can clearly admit that this does not just refer to the faith of any individual, a faith which can be open to individual interpretations and thus open to misunderstanding and heresy. Neither can be a faith that can be supplanted and reinvented, though it always necessarily must be renewed. It must always be a faith built upon the firm foundation of the Rock of Peter, the Chair of Peter, interpreted by the Magisterium, the Teaching authority of the Church over the ages, providing it always with a stable foundation amid the vicissitudes of history. Thus, even when much has been forgotten and still more has been suppressed, let us never forget the significance of the Chair of St Peter, the gift of the authority and power to serve of the cause of unity in charity based upon the Truth. For we can be certain of this, as Pope St Leo the Great, in expounding the meaning of today’s gospel, wrote: “The gates of hell shall not silence this confession of faith; the chains of death shall not bind it. Its words are the words of life. As they lift up to heaven those who profess them, so they send down to hell those who contradict them.” For those planning mischief and plotting destruction of the Church of Christ, you don’t want get in between the Rock and the Hard Chair!